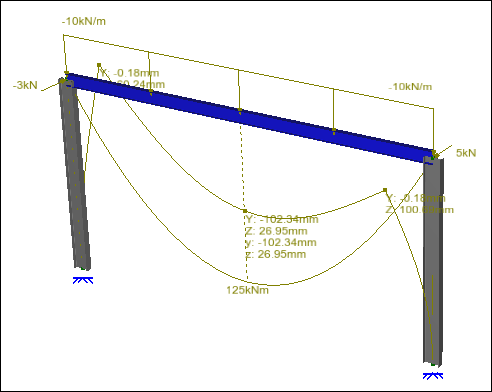 Here's what you need to ensure that SPACE GASS works as it was designed to do. We're sorry that there is no specific Apple Mac version of SPACE GASS, but the good news is that if you set up a BootCamp partition and install Windows in it then SPACE GASS will run just fine. Alternatively, you can run SPACE GASS on your Mac with a Windows emulator such as Parallels Desktop (although it only works in a slowish software emulation mode). Note that the VMWare Fusion emulator does not work with SPACE GASS. Optimize SPACE GASS To Use Your Hardware Correctly - Don't skip this! The following instructions are intended for SPACE GASS 12.50 and later. A number of the items discussed do not apply to earlier versions of SPACE GASS. Fast, smooth graphics with most modern graphics cards by taking advantage of their awesome parallel processing power. Fully rendered deflections rather than just wireframe. 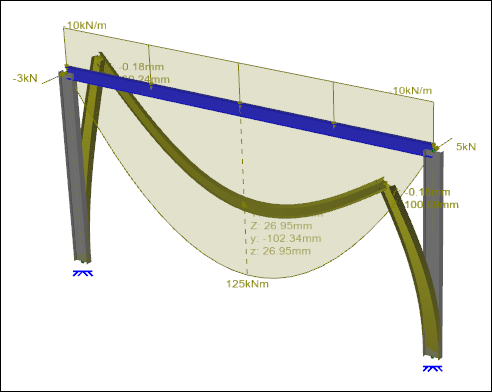 Shaded and transparent loading, moment, shear, axial, torsion and stress diagrams. The entire graphical user interface being silky smooth and responsive. The difference between SPACE GASS running in OpenGL shader mode instead of software emulation mode is DRAMATIC and makes SPACE GASS much more of a pleasure to use! 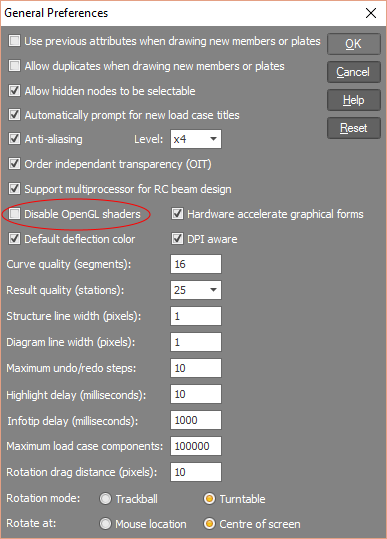 It is therefore well worthwhile carefully following the steps below to enable OpenGL shader mode. Each of the following steps is very important! You can do this by running SPACE GASS 12.50.436 or later, going to "Help => About SPACE GASS..." and looking at the graphics cards listed under "Available Cards". If you can't run SPACE GASS then you should run MSInfo32.exe from your Windows Start menu, expand the "Components" section of the menu tree on the left and then click on "Display" in the expanded tree. Detailed information about your graphics card(s) will then be displayed on the right. Note that if you have multiple graphics cards then you may need to scroll to see them all. NVIDIA graphics cards: Right-click on a blank space of your desktop and select "NVIDIA Control Panel". When the NVIDIA control panel appears, select "Manage 3D settings" in the menu on the left, click the "Program Settings" tab on the right, select sgwin.exe from your SPACE GASS program folder in the "Select a program to customize" list (click the "Add" button to add SPACE GASS to the list if it doesn't appear there), select "High-performance NVIDIA processor" in the "Select the preferred graphics processor for this program" list and then click the "Apply" button in the bottom-right corner. AMD graphics cards: Right-click on a blank space of your desktop and select "AMD Radeon Settings". In the AMD Radeon Settings screen that appears, click "System" at the top, followed by "Switchable Graphics" and then look for "sgwin.exe" in the "Recent Applications" or "Current Applications" lists. If sgwin.exe isn't listed then use the Browse button to locate it in your SPACE GASS program folder and add it to the list. Click the drop-down arrow on the sgwin.exe button and then set it to "High Performance". This will then take effect when SPACE GASS is restarted. Note that this procedure may vary from one AMD graphics card to the next and so the steps may be slightly different for you. Other graphics cards: The procedure depends on the brand of your graphics card. It is recommended that you right-click on a blank space of your desktop and see what graphics card options are available in the popup menu that appears. If all else fails, refer to the instructions on the graphics card manufacturer's website. Setting the high performance graphics card for SPACE GASS only needs to be done once and from then on you can start SPACE GASS in the normal way by double-clicking its shortcut. Note that if you uninstall SPACE GASS and then re-install it, you may have to repeat this step. The graphics driver contains the OpenGL software that SPACE GASS uses and it is very important that this is up-to-date, otherwise the SPACE GASS graphics may not work correctly and may even crash. 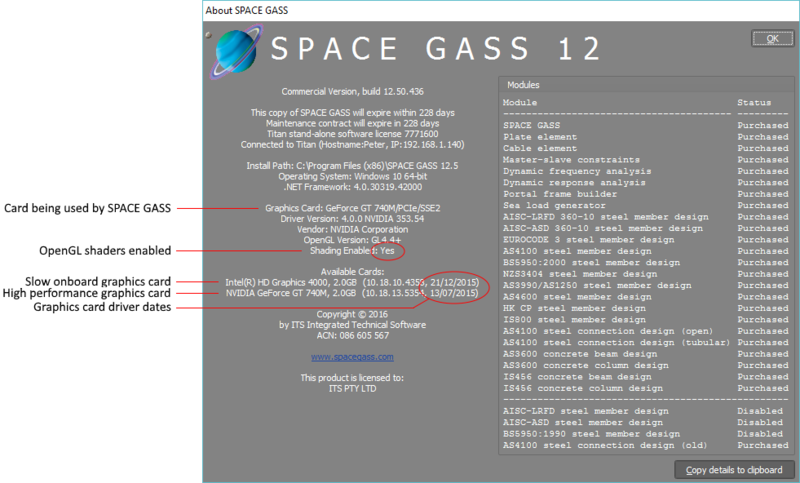 You can check the version of your graphics driver by running SPACE GASS, going to "Help => About SPACE GASS..." and looking at the driver version numbers and dates as shown below. Update the driver for the graphics card used by SPACE GASS via the card manufacturer's website. Do not use Windows Update! Links for some common graphics card manufacturers are: NVIDIA, AMD, ATI, HP and Intel. Note that if you are updating the driver for your graphics card, do not tick the box to install Raptr or PlaysTV because they will cause SPACE GASS and other high-end graphics programs to crash. If you still have problems after updating your graphics driver then check if Raptr or PlaysTV are installed and uninstall them! Run SPACE GASS, go to "Settings => General Preferences" and check that "Disable OpenGL shaders" is unticked. If ticked, it will be forcing SPACE GASS to run its graphical user interface in a slow software emulation mode. If it is ticked then untick it. Once you have successfully followed the above steps, shut down SPACE GASS and then restart it via its shortcut in the normal way. Go to "Help => About SPACE GASS..." and check the "Graphics Card" field and the "Available Cards" fields. The slow onboard graphics cards are typically Intel and are vastly inferior to NVIDIA, AMD or ATI cards. Also check the "Shading Enabled" field and make sure it says "Yes". If it is still using the wrong graphics card or if "Shading Enabled" says "No" then repeat the above steps and check them again. If you need assistance then feel free to email us at admin@spacegass.com, and please attach an image of your "Help => About SPACE GASS..." display to the email so that we can see the details of your system.